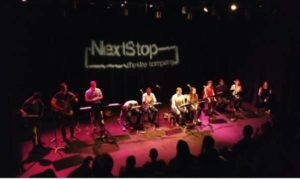 NextStop Theatre Company is rolling out a new program to strengthen the network of D.C.-area playwrights. The Herndon-based, nonprofit theatre company unveiled The Playwrights’ Initiative on Friday (Feb. 8) to help connect artists and to provide resources often needed for new theatrical works. First, the theatre company will host an inaugural “Playwrights’ Mixer and Pitch-fest” on March 23. NextStop Theatre Company plans to invite 30 local playwrights network with each other and local directors and producers before each playwright pitches their work to the group. After the event, playwrights in attendance will have the opportunity to complete a survey about the pitches, which will help NextStop Theatre Company select the works for a series of free staged readings. The theatre company plans to have professional actors and directors take part in the developmental readings, which are slated to take place over six months. The Playwrights’ Initiative is partly funded by a grant from ArtsFairfax.